This project began as an idea to memorialize the events of 9 - 11 and to create a method of providing funds for the families that lost loved ones. I wanted to do something for the families and victims. I also wanted to do something to help the country heal. The coins were designed, produced and financed by myself. All of the artwork was created by myself or paid for or releases were provided. One coin was planned and as it materialized for the firefighters it became apparent that another was needed for the Pentagon personnel. When two were designed, a third was developed for E.M.S. & Police Officers. And as praise was given, it was then decided to make a fourth for non public safety victims. This Coin, The Patriots, will benefit victims and families from all three states, New York, Pennsylvania and Virginia. Now 14 coins are available. An FDNY Memorial Day Coin, A Dispatch oriented Coin, a Patriot Day Coin, A United We Stand Coin and a coin designed by the Counter Terrorism Task Force at the penatgon called Combating Terrorism. Also Silver Memorial coins and a Special Operations Coin. The COINS are made of high quality metals with a SOLID Brass core and plated with a Silver Alloy metal. The coins are DIE STRUCK not die cast and minted with HAND tooled DIES. And, then hand painted with a BAKED on Enamel. Then, they are coated with a CLEAR Epoxy coat to preserve the coins forever against the elements as well as human skin oils. They are shipped in a BLUE Velvet box for not only safety but for display. The designs were developed by myself with the help of a few very special people who contributed some of the artwork or photographs or ideas. One is an Emergency Room Nurse who I have known for 20 years. She took the image of Lower Manhatten with her son while visiting New York in 2000. I edited it and de-saturated it and cropped out what was not needed. The image of The Saint Florian was taken by the family (Marc Baron Tantillo) of an Austrian, Josef Josephu, who created the 12 foot tall bronze statue that was completed in 1935. It survive WWII when the church that it stood in front of was hit with a bomb. It is now located in the Vienna Fire Service Museum in Am Hof Austria. His family gave me permission to use the photo as a draft for the coin. The Saint Micheal image was taken by myself from a lawn statue. The Pentagon design was drafted from a fabric patch created by a Virginia Fire Chief, Penny Jingles. The other ideas came from my own thoughts and advice from friends and family. I sketched the Lady Liberty from a photo my brother took when he lived in New York in the 80's. The flag on the Patriots Coin was drafted from a digital photo I took while in Northridge CA. on a mission for The Paramedics For Children. It was a newly painted mural on the side of an office complex near the parking lot. The Dispatch Coin was created with the help of two dispatchers from San Diego Fire Communications Center. 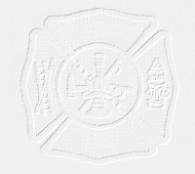 The FDNY Memorial Coin was inspired by my visit to New York on October 12th. 2002. Truly this is an international effort as well as a National one, as many people were involved. It was funded privately by myself as well as managed and administered. All proceeds are non profit as the cost recovery will re-pay the investment for the production and design and the administration and management of the operation. 5.00 will be donated for each coin sold to the respected group that is recognized by the coin. Your COIN Order will be shipped via the US Post Office A.S.A.P. Please be patient as it might take up to 12 weeks... There are coins available in stock now and shipment can be facilitated for delivery before September 11. The COINS are hand made and the process take up to 1.5 months if we are out of stock. I am a Fire Fighter Paramedic for The City of San Diego, California, and currently work at Station 34 on Engine & Brush 34. I have a family and live in Suburban San Diego County. Thank you for your interest in the coins.